Depression is a serious mental health condition, and the most common, in the U.S. We help you learn more about this condition, what symptoms to look for, and alternative treatments that are available – and so much more. Incidentally, your fans are searching for information regarding this disease, and with this package you can educate them AND make money. Use the individual articles as blog posts, autoresponder content or compile the articles into a subscriber report. The choice is yours. 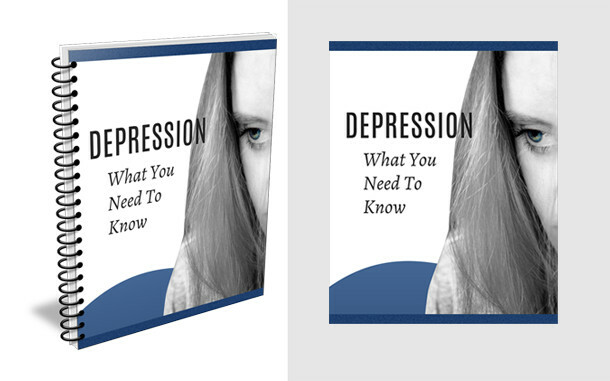 Covers the basics of depression, which include copies of the content in PDF, Word and Text formats. The social media tips are easily transformed into Tweets for Twitter content. You’ll find 20 tweets to direct traffic back to your posted articles or landing pages. Add hashtags to suit your needs. You’ll receive a total of 95 slides. Each slide deck measures 1,280 x 720 pixels when exported into individual slides. This is the perfect size to create a high definition slideshow or video. This Amazon list offers tangible products you might want to consider promoting from your blog to earn commissions from this PLR package. Like many medical conditions, depression can be dangerous. It can affect you regardless of your age, gender, or race. However, some people are more susceptible to depression than others. Women and teens are two demographics that are at an increased risk for depression. In severe cases, depression can be fatal. But it can also cause other problems that may make life difficult for someone that’s already struggling with depression. There are three dangers we frequently associate with depression. If you recognize these dangers in yourself or a loved one, talk to a medical doctor immediately. For some people, depression is debilitating. It can interfere with your life and make it difficult to perform everyday tasks. Depression may make it hard for you to concentrate during the day or find motivation to perform your usual duties. In severe cases of depression, you may not have the energy to go to work. As a result, depression may lead you to lose your job and ultimately, your source of income. Losing employment can cause you to become more depressed and make it hard for you to get the medical help you need to treat your condition.